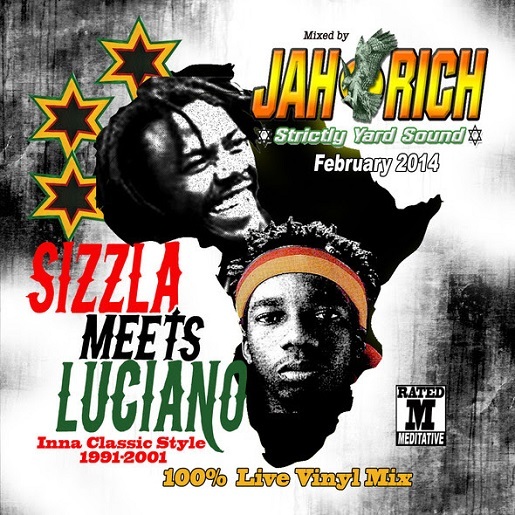 Selector Jah Rich is proud to drop his latest mix CD titled, “Sizzla meets Luciano inna Classic Style 1991-2001.” This 100% live all vinyl mix presents the finest work from reggae legends Sizzla and Luciano. 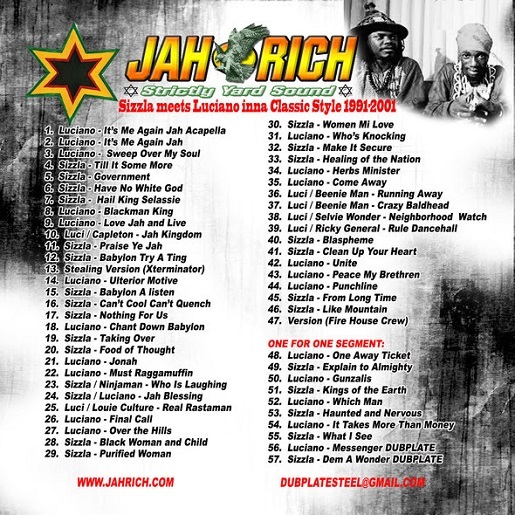 From meditative tunes like Luciano’s “Final Call,” Sizzla’s popular “Black Woman and Child, and Luciano’s “Sweep Over My Soul,” to high energy tracks like Sizzla’s anthem “Praise Yeh Jah,” Luciano’s “Peace My Brethren,” and Sizzla’s boomshot “Food of Thought,” this mix CD has it covered! This well thought out mix also presents gems like Sizzla’s sought after “Purified Woman” and Luciano’s rare cut, “Which Man.” Sizzla meets Luciano also features a special “one for one” segment featuring the two artists’ hardest, wickedest, and most beloved tracks! Selector Jah Rich smoothly mixes and blends the 59 tracks inna style that will keep you rockin’ all the while! This yah mix CD is a sure shot hit massive, so get your hardcopy mix CD for the whip or download the mix online! For more information, please visit www.jahrich.com. Respect!